Use Less Resin, Lower Cost. 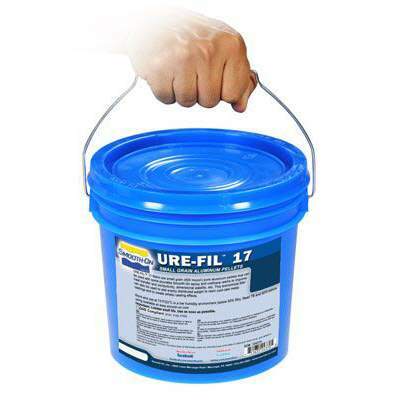 Ceramic filler which is added to urethane resins and castable epoxies to reduce cost. 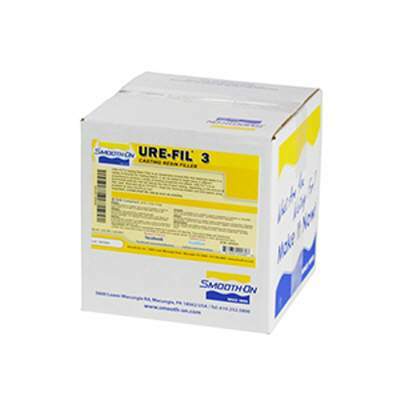 Recommended starting mix ratio is 1A to 1B to 1 part URE‑FIL® 3. The best choice for creating a wood grain effect. Note: your mold must reflect the wood grain pattern of the original model. Mix 1 part filler with 1A:1B of Smooth‑Cast® 320 resin and cast into mold. After demold, apply wood stain or shoe polish to casting surface to bring out wood grain effect. Improves dimensional stability in urethane resins and castable epoxies. Ofen added to materials to make them flame-resistant. URE‑FIL® 7 can be mixed with Smooth‑Cast® 325 and SO‑Strong® color tints to create marble effects. Recommended maximum mix ratio is 1A:1B to 2 parts filler. A mix ratio of 1A:1B to 3 parts filler will make the plastic trowelable, but the cured plastic will also be brittle. Fumed‑silica based thickening agent primarily used with liquid urethane and silicone rubbers for brush‑on moldmaking applications. URE‑FIL® 9 is added in small amounts to the mixed rubber until the desired viscosity is achieved. URE‑FIL® 9 can also be added to liquid urethane resins to create casting effects and to thicken the material for trowelable casting applications. Fiber‑based filler that can be added to Smooth‑On urethane and silicone rubbers, urethane plastics and epoxies to thicken for brush‑on applications. URE‑FIL® 11 can be used with all Smooth‑On silicones, including those which do not respond to THI‑VEX® such as Ecoflex® 00‑30 and Mold Max® 40. Micro‑balloons that can be added to Smooth‑On urethane plastics and epoxies to create very light weight castings. Castings which float on water can be created by using proper proportions of URE‑FIL® 15. A casting resin filled with a large proportion of URE‑FIL® 15 can be described as a ‘syntactic foam’, non‑expanding foams which are stiffer, stronger and more water resistant than water‑blown expanding urethane foams of the same density.